Welcome to the historic Peña-Peck House, one of St. Augustine’s great treasures. It was home to prominent Spanish, British and American families, who helped shape three centuries of St. Augustine’s history. The Peña-Peck House was built circa 1750 by order of the King of Spain for Spanish Royal Treasurer Juan Estevan de Peña and his wife Maria Antonia. Just steps from Government House, its stature was ensured immediately. During the subsequent British occupation, it became home to governors – first, Acting Governor John Moultrie and then, his successor, Governor Patrick Tonyn. In 1784-1785, as British rule ended and Spain regained ownership, the house became the last seat of British government in North America, south of Canada. Our well-versed docents bring this history full circle amidst the 19th-century art and antique furnishings of Connecticut natives Dr. Seth Peck and his wife Sarah Lay Peck. Three generations of Pecks called this magnificent estate “home” for 94 years. Thanks to granddaughter Anna Gardner Burt, it is open to the public today. 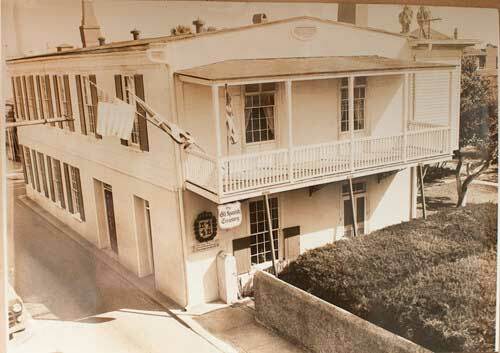 Upon her death in 1931, Miss Anna’s will directed the city of St. Augustine to maintain her home “as an example of the old ante-bellum homes of the South.” The Woman’s Exchange of St. Augustine has lovingly fulfilled that mission for more than eight decades. Many a bride and groom, from near and far, have celebrated their wedding in this garden oasis. Seasonal luncheons by the Woman’s Exchange are sought-after tickets. A gift shop of fine-quality items, primarily hand-crafted by local men and women, helps each of them enhance their economic stability. We invite you to cross our threshold on St. George Street and step into a history and cultural heritage that is unique in all of St. Augustine.